Do you fear that traditional and unpleasant metal braces treatment to align your teeth will turn your life upside down? Well, your fear is not irrelevant, but more importantly we have a solution to it. Introducing Invisalign®, a virtually invisible aligners to align your teeth in the most effective way without being visible to others. Apart from being invisible, it provides you with many benefits that allow you to live your life without any restrictions, whether it’s about eating your favorite meal or maintain the oral hygiene. Find out yourself why Invisalign® is the best mode of treatment to align your teeth and fix your smile. 1) Enjoy Your Favorite Food: From popcorn to whole apple, you can now devour all your favorite food any time you want. Invisalign® aligners are made with SmartTrack® flexible material, making it super easy to remove and put on, unlike normal braces which are fixed. This means you can easily remove your aligners while you enjoy your favorite meals. 2) Minimal Discomfort: Invisalign® ensures gradual and gentle teeth moments in an effective manner while your aligners are on. This gives you much lesser irritation and discomfort that you have to go through while your traditional braces are on. 3) Virtually invisible: Now all your selfies will be captured with a perfect smile! Invisalign aligners are made up of clear plastic that is virtually invisible. Many people may not even notice that you’re wearing aligners, unlike traditional braces where the wire and metals can be seen. With Invisalign®, wherever you go, you can smile without hesitation. 4) Easy Cleaning: In order to keep your aligners fresh and clean you can now brush and rinse them gently with your toothbrush. 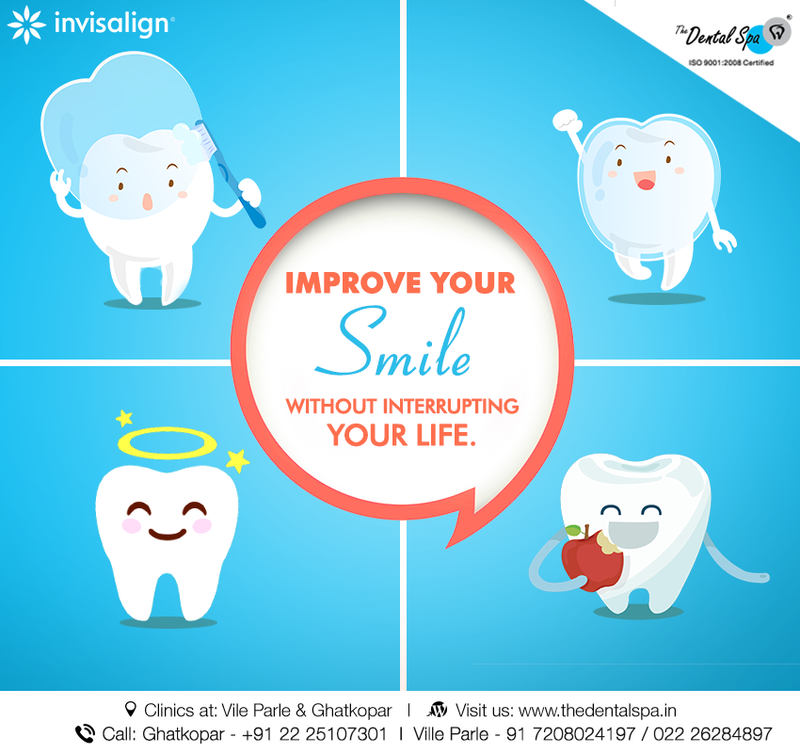 Invisalign® also provides you with ‘Invisalign Cleaning System’ that helps you to keep your aligners clear and germs free. 5) 2x fewer doctor visits: Now you need not spoil most of your weekends for a doctor’s visits, while your aligners are on. Unlike traditional braces where you have to visit your doctor once in 3-4 weeks, Invisalign frees up your schedule with visits to the clinic only once in 6-8 weeks. Thus, you can give more time towards other commitments of life.